Last year, Brian tried to cry. This year, he just might. Don’t miss Brian’s most personal performance – ever. Presented as part of 1st Thursdays at Orlando Museum of Art. The theme for April 2010 is The Happy Show: From the sincerely sweet to the somewhat saccharin, this show highlights the sunny side of life. LYNX (Central Florida Regional Transportation Authority): From Central Station, take Link 125 to Rollins Street at Mills Avenue. The bus stop is directly across from Orlando Museum of Art. | Vehicle parking is free at Orlando Loch Haven Park and overflow parking is available at the Orlando Science Center parking garage for $5 per vehicle. | Biking and walking are both good for you and pleasant modes of transportation on a Thursday night, and anytime! If riding, please wear a helmet and flashing light (and reflective strip if you have one)! Bike racks are available on the north side of Orlando Museum of Art. And don’t forget your bike lock! BRIAN FELDMAN PROJECTS is Central Florida’s premiere presenter of experimental time-based art since 2003. Dinners on stage with real life families, leaping off ladders for 24 hours, group tours in Google translated Swedish through IKEA®, 🙂 ≠ 🙂 – this is what we do. Upcoming projects include PILLOWLANDO MMX (3 Apr 2010), 67 Books (11-17 Apr 2010) and 25 Movies Brian Feldman Has Seen At Enzian Theater (19-20 Apr 2010). 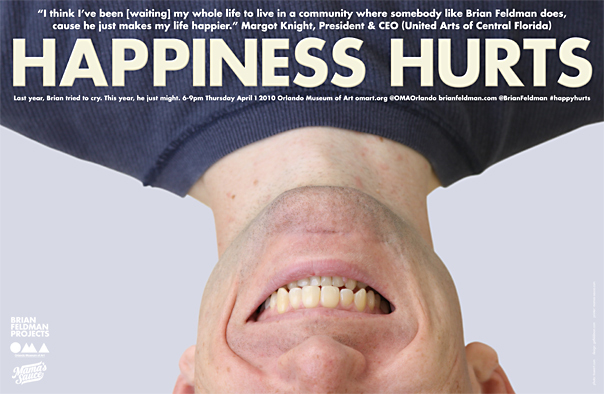 This entry was posted in Orlando theater, Other arts, Performance art and tagged 1st thursdays, brian feldman, edward alan feldman, happiness hurts, orlando museum of art, tisse mallon. Bookmark the permalink.